Hi! My name is Kim Firth Leonard (@KimFLeonard). I have been working in program evaluation and/or higher education assessment for about as long as Twitter has been around, but only joined the fray about a year ago. I believe Twitter can be a rich professional development resource – this post is meant to help fellow evaluators tap into this resource too. Lesson learned: Twitter is a micro-blog. There are wonderful insights, blossoming ideas, and important questions posed in those 140 character posts. I frequently discover things I want to learn more about in my Twitter feed. “Favoriting” tweets allows me to show my support for a post or idea and return to it later when I have time to dig deeper. 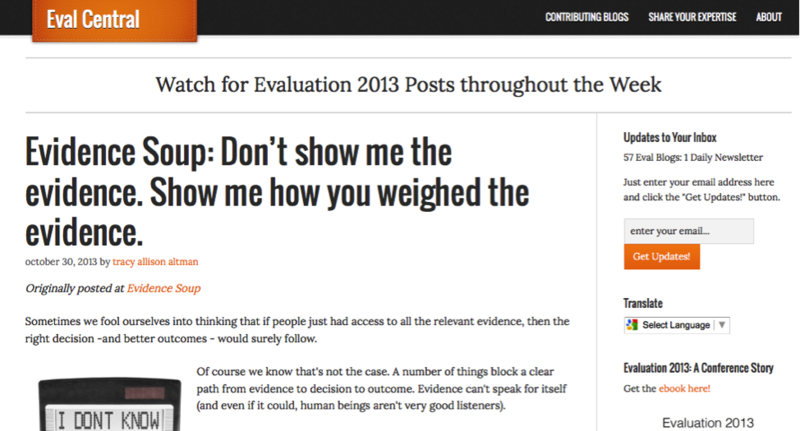 Click through that link and you land on the Eval Central blog and a rich post from Evidence Soup that includes a number of additional links to yet more information! Lesson learned: Twitter is a learning community that provides opportunities to engage with other evaluators to share information and discuss topics of interest. I’ve “met” and gotten to know a number of evaluators through Twitter who I might not otherwise have met at all (like @SheilaBRobinson and @AnnKEmery). And Twitter can remove distance and intimidation barriers as well. It’s been delightful to connect with evaluators I might never have approached directly in real life, like Dr David Fetterman (@EmpowerEvaluate) and Stephanie Evergreen (@evalu8r)! Hot Tip: Email inbox growing cluttered? No time to read your RSS feeds or the many blog emails filling your screen? Use Twitter to keep track of your favorite evaluation blogs. Not only are bloggers on Twitter likely to post links to their new work, but the work of others that is likely of interest. Better still, follow @evalcentral, an evaluation blog aggregator managed by Chris Lysy (@clysy). Rad Resource: AEA keeps a list of evaluators on Twitter posted on its website. There are almost two dozen organizations and over 100 individuals listed! Hot Tip: Here are just a few of my favorites not already mentioned. Know of others? Add them in the comments. Hot Tip: It’s easy to join! All you need is an email address to get started at www.twitter.com. The more evaluators in the twitter-sphere, the richer the resource for all of us! Here’s a question about using twitter that puzzles me. Should the hashtag be #eval? Or #evaluation? #eval tends to be more focused on evaluation more broadly whereas #evaluation often picks up people’s tweets about their personnel reviews. But #eval seems like a jargon insider term that might not connect with people broadly. What do you recommend? And thanks for the shoutout. You could also add @BetterEval to the twitter list – we share information about new material and events on the BetterEvaluation site and also great ideas and examples from elsewhere. Great question! I’d love to hear others thoughts, but my take mirrors yours. I do worry about #eval being too shorthand for our own good, but I have a hard time finding room for #evaluation in many of my posts, and #eval is my favorite way to search for information, because it seems to be truly program evaluation focused as opposed to the broader use of #evaluation. I actually end up using, and looking for more specific hashtags often – like #dataviz (a current favorite). @BetterEval is on the list – it is a very good resource! How do you mine the data in twitter. I have tried different apps, but have not found one I am happy with. @data2insight is the feed for our independent eval and research firm that specializes in science, technology, engineering and math education program eval/research and data visualization to complement eval (e.g. data dashboards). What are you trying to accomplish mining Twitter? Are you looking for just real-time mentions or are you trying to pull out all the tweets that mention a topic over a set period of time? Just using something like hootsuite, with several search terms setup, can give you a simple and free monitoring tool. For more data, you can use nodeXL’s connection to the Twitter API to pull down all tweets based on search or following. Only caution, there is a lot of data on Twitter, if you ask for too much you can freeze it up and get nothing. Are you referring to how to find things? Or how to do something analytically with tweets themselves? I tend to use Twitter like I would browse the internet more generally, or a library. I look through the posts from the last day or two in my Twitter feed, skimming for pieces that interest me. Then I might search by hashtag (#) to look for other discussions of interest – like #dataviz or #eval or #eval13 (from the AEA conference). There may be more efficient ways to look for info, but I find that this leads to interesting discoveries I might not have made otherwise. I’m also just using the good-old Twitter app thus far. I’ve poked around with some of the other apps but not found one I love just yet. I’ll check out Hootsuite again now that Chris is recommending it. Seriously Kim, you’ve only been on Twitter for a year! You really caught on quickly, because I would have guessed you’ve been tweeting for much longer. Thanks Chris!! I really dove in, and feel like I’m still feeling my way around at times too. I find that I ‘binge’ on Twitter at times, and need breaks from it to avoid being overwhelmed at other times.